We were only together for three days, but we shared many profound moments. 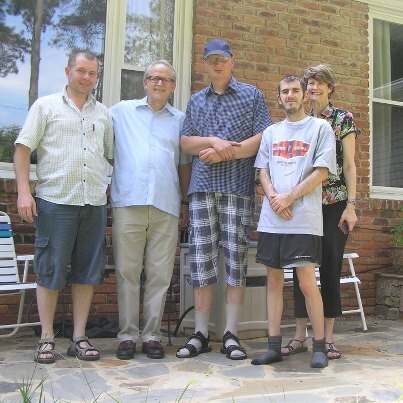 And it is a stretch to share such deep heart connections that our family made with Rimas and Martynas during the home visit weekend prior to the L’Arche International Assembly held in Atlanta in June of 2012. But, I’ll give it a try. Rimas is the community director for L’Arche in Vilnius, Lithuania that is called Betzatos Bendruomene which means Bethesda Community commemorating the healing that Jesus did in the pool called Bethesda in Jerusalem. Martynas was the founding core member of the community and is an accomplished artist. Rimas was a Franciscan Brother for five years before God called him into business and he is now married with three children. We made our initial introductions via Skype a few days before their arrival in Atlanta. We had a wonderful time from the start, enjoying cooking out, sharing experiences and stories of how we became involved with L’Arche. Martynas had a short list of sites he wanted to see and things he wanted to do, so, Saturday was a long and full day. After a hearty breakfast of waffles, bacon, and fruit, we were off to explore downtown Atlanta. Martynas wanted to buy a Coca-Cola from the World of Coke and we stopped off at Centennial Olympic Park and I explained the various neighborhoods, businesses and sports venues along the way. We swung back by our home in the Oak Grove neighborhood and ate some lunch. I had bought a loaf of black rye bread which is a Lithuanian staple and we ate it at every meal. Then, my 22-year-old son Jed, Martynas, Rimas and I were off to Stone Mtn. to go hiking. Since it wasn’t too hot, we decided to hike up the mountain. Everyone survived and enjoyed the perspective from the top of the largest granite outcropping in the world. Back at our house, we enjoyed cooking and eating outside and talking about our day. All along the way, we talked about life in our respective countries. Rimas spoke good conversational English, and although Martynas was fairly limited, he did not hesitate to ask Rimas to translate his questions for us. Shortly after dinner, Martynas, who requires a bit more sleep than we did, was off to bed. Our son Jed retired around 10:00 PM. So, it was my wife Jenny, Rimas and I who were talking at our dining room table. Jenny was enjoying a glass of wine, Rimas was sampling some of our fine local craft beer and I was drinking Lithuania’s oldest and noblest drink – mead – that Rimas had brought as a gift for us. I was asking Rimas about his parents and his home life growing up. I had no idea of the power of the story he was about to tell. Rimas said that when his mother was five years old she and her twin sister were shipped to Siberia. Over one million Lithuanians (one-third of it’s 1940 population) were lost during World War II during Nazi and Soviet occupations through deportations, executions, incarceration and forced emigration. Over 150,000 were taken from their homeland and forced to go to Siberia, the Arctic Circle or central Asia by the communist government of Josef Stalin. Separated from her parents, after a four-week trip in a boxcar built for animals the five-year-old girl was forced off the train in Siberia and told to fend for herself. I was shocked as my friend shared such a painful story. I tried to imagine how a five-year-old would feel. He went on to say that after five years of that Siberian exile, she was able to escape and sneak on to a passenger train and spend two-weeks traveling the 4,500 kilometers back to her country. She made contact with an uncle and eventually made it to her uncle’s home where she was raised. Her twin sister stayed for a few years more in Siberia before being able to return to Lithuania. Approximately 30,000 died in Siberia due to starvation and slave work and another 50,000 were never able to return to Lithuania. Rimas said that his father also had a similar experience and his parents met after they had returned to Lithuania. One of the challenges in 21st Century Lithuania is teaching the next generation about the pain and suffering of the past. Because life is so good now, there is a tendency to forget the past or not be aware of the price paid by previous generations. He said that he has told these stories to his own children and that there is a movement in Lithuania to share stories from 75 years ago. As we talked, I was reminded that there is a story in each of us. And that it is in the sharing of our stories that we are changed and made more whole. The visit of Rimas and Martynas has now become a part of my family’s story. What’s your story? Won’t you share it with us! We have to trust that our stories deserve to be told. We may discover that the better we tell our stories the better we will want to live them. ~ Henri Nouwen, Bread for the Journey.